A pie and a tart both have a crust and a filling which is why people think they are the same. Although they have almost the same appearance, a pie is actually completely different from a tart. In what way? This article will explore the difference between a pie and a tart. A pie is a baked dish that has a crust and a filling. Its soft and crispy crust is made of flour, water, fat (butter, vegetable shortening, or lard), and sometimes sugar. It can be open-faced (having a bottom crust only) or sealed (having a double crust – top and bottom). The filling is loose and can be sweet or savory. Vegetables, fruits, and even meat can be used for the filling. A pie has sloped or slanted sides. It is served right from the pie dish or baking pan. Traditionally, pies are baked in a round dish (called pie dish or pie pan) but modern pies can also be square or rectangular. 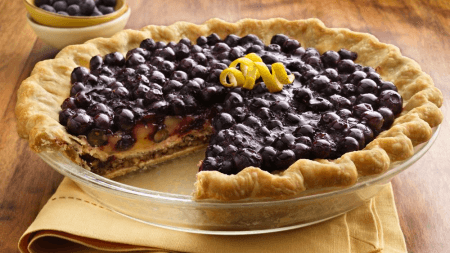 On the other hand, a tart is a baked product that has a bottom crust and a filling. Its crust is rich, firm, and crumbly and is made of flour, water, and butter. Its filling is thick and can be sweet or savory. Most tarts nowadays, however, are made with sweet and fruity fillings. Tarts are baked in a shallow pan (called tart pan) with either ridged or fluted sides. The pans have straight sides (not sloped) and usually have a removable bottom so the tart can easily be taken out. 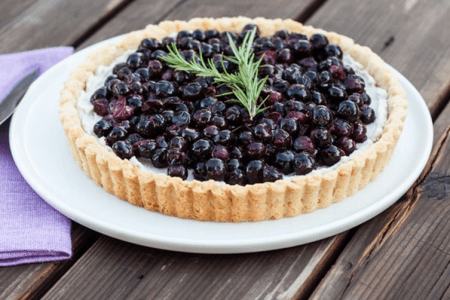 Tarts are served on a platter or dessert plate as they can stand firmly when removed from the baking pan. Traditional tarts are round, but square and rectangular tarts are also available these days. What, then, is the difference between a pie and a tart? A pie has a soft but crispy crust. It always has a bottom crust but it can have a top crust (with both top and bottom pinched together to seal the filling in) or be open. Its filling is loose. A tart, on the other hand, has a crumbly bottom crust and a thick filling. Additionally, a pie has sloped sides while a tart has straight sides. A pie is served right on a baking dish whereas a tart is served on a platter or dessert plate as it can stand on its own.